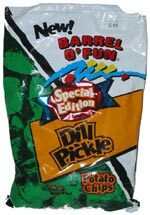 Taste test: Guest reviewer Adam Kay reports: "Tastes like a mild salt and vinegar chip with a hint of dill. Some of the chips were way more tangy than others. Some were way saltier. Mildly crunchy." Smell test: Smells like wicker furniture and dill ... but mostly like wicker. 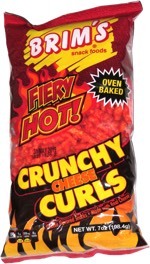 This snack was discovered by Adam Kay at Homeland Supermarket Store #605, Hereford, Texas.